After you have been caught sailing in a storm, everything else is just a breeze. 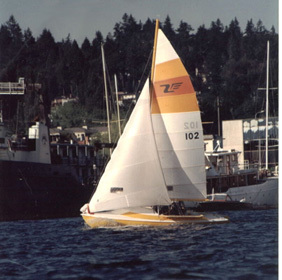 A 22' Prototype Racing Sailboat that is exceptionally fast in both light and strong winds, sailed usually with a three-man crew. A Blue Collar Skipper (who usually does not practice for the races). The crew that I owe a lot of thanks to (who usually does not practice too). A team that has been placing in the top 3 in its class for several years & in the top 3 overall in the last series of 12 races against up to 50 boats, that range between 22 to 55'.